A jacket is good for outdoor activities and very casual get-ups. Beyond that, though, you need a nicer overcoat for a wide variety of events: daily work at a professional job or the occasional job interview; going out to a bar, restaurant, or movie; coffee dates, theater dates, and every kind of date in between; winter weddings or funerals; Christmas mass and a New Year’s Eve gala. Not every kind of overcoat achieves the same all-around adaptability, however. Some are more casual and don’t work with formalwear as well, while some are so formal they’d look out of place over jeans. The key is to pick an overcoat with the fit, length, fabric, and style that give it a not-too-formal, not-too-casual look that will be appropriate for nearly every occasion. STYLE. The double-breasted overcoat goes in and out of style, and is a nice choice for wearing to a conservative workplace or more formal events. But a single-breasted coat is more classic and versatile, and pairs as well with a suit as a sweater and jeans. While a double-breasted overcoat should be worn buttoned and closed, a single-breasted can be worn open for a casual look. The single-breasted, as it involves less fabric around your midsection, is also more flattering and slimming. 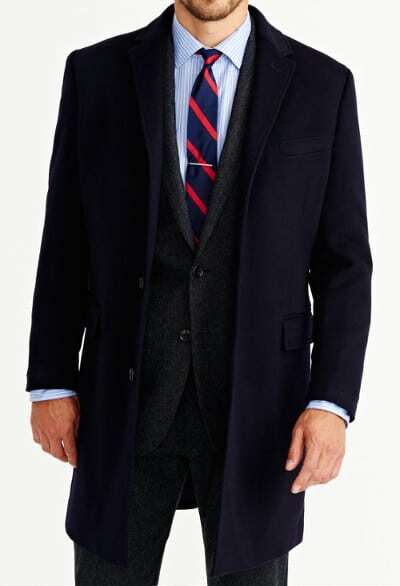 Single-breasted overcoats are especially recommended for short men; the double-breasted variety tends to swallow the petite man up. BUTTON. A 3-button overcoat is the most classic way to go. 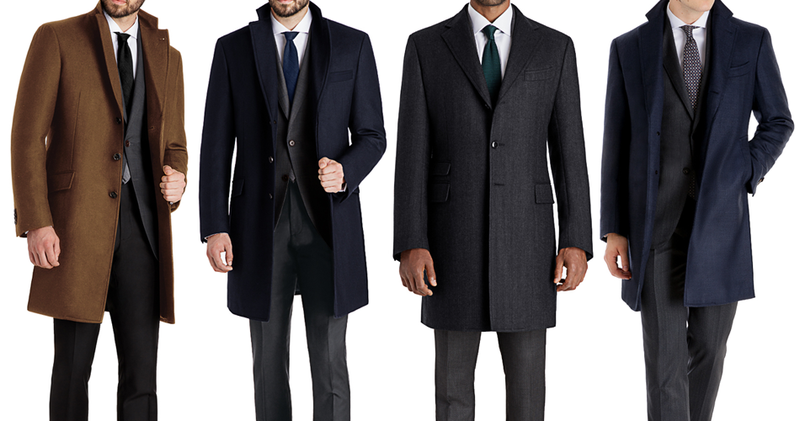 4-button coats tend to be more formal. LAPELS. Notched lapels are typical of single-breasted overcoats and are more casual. Peak lapels are usually found on double-breasted coats and are more formal. Go with notched. COLOR. Rather than black, navy blue is your best and most versatile color choice. It’s serious without being solemn, and looks equally good with both day and evening wear. Dark gray comes in as the second runner up in the color category. A camel-colored number is an attention-grabbing but viable option if you own multiple overcoats, but for our minimalistic purposes, navy or gray will be more versatile; you’re not going to pull a brown coat on over your formalwear. FABRIC. For weight and durability, 100% wool is the way to go; it’s warm and durable and will last forever. Cashmere coats have a nice, rich-looking finish, and are lighter, softer, and warmer. But cashmere comes with an enormous price tag, doesn’t hold up to the elements as well, and wears out and pills easier. And since this is outerwear we’re talking about, extra softness doesn’t matter much. Some coats add a layer of synthetic microfiber for extra warmth, which can be a good idea if you live in a particularly cold place, but 100% wool should do it for most. Look for a nice hefty fabric; a good overcoat should weigh around 4 pounds.